Everyone wants their home to be safe and secure, yet only 17% of home owners own a home security system. Why? Because traditional systems cost hundreds of dollars to install, require long-term contracts and mean a lifetime of monthly fees. Today, however, wireless technology has blown the DIY home security space wide open. Home owners and renters can now build and maintain their own custom-designed home security system easily and inexpensively. We’ll discuss the options for DIY home security systems that offer similar — and in some cases, better — functionality to traditional systems, at substantially less cost. From connected cameras to smart sensors and whole home systems (with no monthly fees), to simple all-in-one gadgets, read on to find peace of mind for the right price. 1) If you have a large home with lots of access points, consider an expandable home security kit. 2) If you are a renter in a small apartment, a portable all-in-one device will suit your needs best. 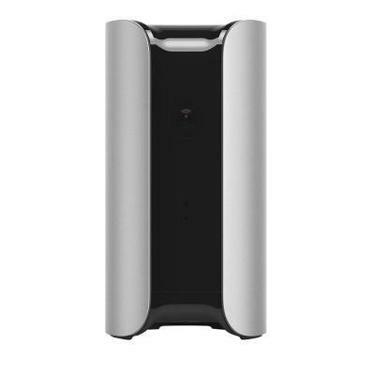 3) If you are somewhere in between these two scenarios, then you are a candidate for an “a la carte” security system where you pick and choose different products to custom-design your own home security solution. Remember, home security is no longer just about awareness of break-ins or house fires. The power of the Internet of Things, combined with the ubiquity of smartphones and tablets, means we have access to an unprecedented level of control over our homes. From checking in on the new puppy while at the office, to shutting off the water when a pipe bursts, your home security system can now talk directly to you, cutting out the traditional security system middleman. Even better, you can talk back to it, so you can control your home from anywhere. * Wireless — This is the closest thing to a traditional surveillance system, but because it is wireless you can install it yourself. With a minimum of four bullet style cameras hooked up to a digital video recorder, you can have professional quality interior or exterior monitoring for a fraction of the professional price. Choose weatherproof cameras with infrared night vision and a good range (between 60 and 150 feet). You also need to have a DVR with enough storage to hold all the footage captured by your cameras—1 TB for four cameras is about right. Look for expandability, so you can add cameras to the system should the need arise. * WiFi cameras — This is the new kid on the block when it comes to home security, made popular by companies like Dropcam. 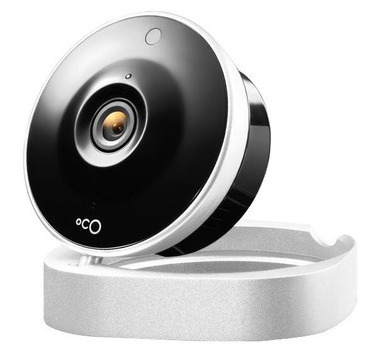 Connected to the Internet via WiFi, these cameras can be easily and quickly installed (just plug them in and turn them on) and provide a live feed of your home instantly. You can install just one, or several to provide whole home coverage. If you have family members or roommates often home when you’re not, look for facial recognition capability, to cut down on the number of unnecessary alerts you receive. WiFi cameras don’t need a DVR as they stream their footage to the cloud, allowing you to access live footage on a computer or mobile device. For a small monthly fee (usually around $6) you can access stored video to playback or download recordings. Most WiFi cameras are suitable for indoor use only. * Motion sensors — These are simple, slim devices that attach to your window or door and emit a loud noise if someone tries to open them. Basic models, such as the Doberman Door and Window Defender ($12.98) or the Swann Magnetic Window/Door Alarm ($7.95), operate as standalone wireless alarms, triggered by movement or vibration. They’re perfect for that window or door that should never be opened. * Motion detectors — These differ from motion sensors by sensing when a person or animal is moving in a space, rather than knowing when an object is opened or closed. Paired with outdoor lighting, such as the Defiant Motion Security Light ($149), you can have an excellent deterrent for prowlers. Wireless motion sensors can also be easily installed by a front or back door, as long as there is a power socket nearby, and can be set to make a noise or turn on a light when someone passes through an area. * Smart motion sensors and detectors — Smart motion sensors or detectors connect to WiFi and send alerts to your smartphone when activated. They can also communicate with other devices in your home to set off an alarm or initiate another action. For example, the Belkin WeMo Switch + Motion work together to turn a light on when someone enters a room—both a security feature and a convenience for a homeowner coming home in the dark. You can also configure smart motion sensors to send you alerts when specific actions occur, trigger your cameras to start recording so you can log on to your surveillance system, see what’s happening and, if necessary, alert the authorities, in the same way a traditional security monitoring system would. * Environmental sensors — Every home should have a smoke alarm and a carbon monoxide detector. These basic sensors have been proven to save lives. More advanced environmental sensors include the ability to detect moisture levels, humidity and temperature. Connected devices can often pair with other products to expand their functionality. For example if you have a Nest Protect sensor, it can communicate with a Nest Thermostat, which will shut off the furnace if it senses smoke. * Smart lights — A tried and true home security method is having a light set on a timer to come on and off at certain times, giving the appearance that someone is home when they are not. A home that appears occupied is far less likely to be targeted for theft. Timers, however, are timed, meaning there is a routine that a thief might spot. Install some “smart” light bulbs, such as Philips Hue or GE Link and you can set any schedule you like for your two weeks in the Bahamas, and make it random enough to confound any burglar. 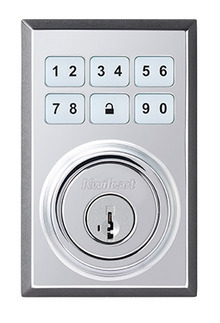 * Keypad — If you just want to avoid endlessly handing out keys, a keypad entry provides a safe and secure way to allow entry to multiple trusted people without cutting multiple keys. You can also change the code if you want to revoke someone’s access without changing the locks. * Smart locks — Smart locks don’t require a physical key (although most still work with one). Instead, they use your smartphone to authenticate access, normally via Bluetooth. This technology allows you to send digital keys to visitors or other people you need to grant temporary access. Additionally, smart locks allow you to lock and unlock your door remotely and set it to unlock on approach, so you don’t need to get your phone out of your pocket. Plus, you can receive notifications about the comings and goings in your home. * Smart doorbells — Doorbells are also getting smart, and these once insignificant devices are poised to play a growing role in home security systems. Although there are relatively few products on the market currently, the concept is solid: when someone rings your doorbell, your phone will ring and a built-in-camera will show you who is at the door. Two-way communication can let you talk to the person, giving the illusion you are at home even if you are halfway around the world. * Smart garage door openers — Garage doors connected to WiFi, such as the Chamberlain MyQ Garage Door Controller ($129), let you open and close your garage door from anywhere, plus check to make sure it is open or closed. This is another great option for allowing secure access to your home when necessary. 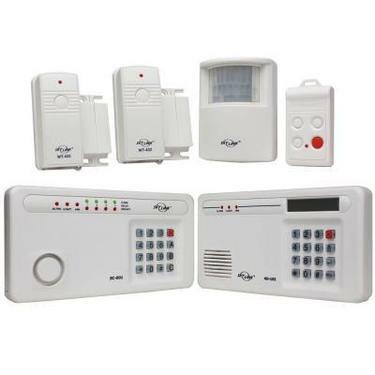 * Simple system — This is a wireless alarm system that is self-installed and operated through a keypad controller and/or portable key fob. You place sensors around your home and designate security zones. If the zones are breached, the alarm will sound. Some will also notify you via phone. These systems are expandable, allowing you to add components based on your changing needs. Higher end versions, such as the one offered by Tattletale ($558), include 24/7 dispatch monitoring and text and email notifications for a low monthly fee. Look for the “pet mode” feature if you have animals, to help limit false alarms. * Wireless smart systems — Smart home security systems do everything the simple systems do, and can likewise be installed entirely by the homeowner. They are also expandable, portable (so you can take it with you when you move), and some come with traditional monitoring but without long-term commitments. Some options currently on the market include Simplisafe ($229 and up), which offers a comprehensive, easy to use system with optional live monitoring (that you pay $14.99 a month for, but with no contract). Simplisafe packages include a wireless keypad, carbon monoxide sensor, motion sensors, panic button, smoke detector, entry sensor and a base station, but you can add up to 41 devices per base station. “Smarts” in the system include features such as a smoke alarm that will beep when it senses smoke, but also trigger your alarm, alert a dispatcher and notify you over email or SMS. Another option that moves further into the home automation space is SmartThings. The smart home company offers three custom security kits ($389 and up) that include basic alarms and sensors, but with the added capability of smart home integrations. You can get alerts sent to your phone when water is detected or doors or windows open unexpectedly. Useful features include sensors to trigger lights to a certain brightness if there’s motion or entry and notifications when people come and go from your home. Smart home security kits like these can be used as the basis for a complete home automation system. All-in-one systems include sensors, smarts and cameras all in one device—“a whole home smart security system in a box.” Ideal for renters or short term visits (hotel rooms, vacation rentals, etc. ), often you can daisy-chain these stand-alone devices to create a larger system. The big advantage of an all-in-one device is that there is no “networking” required, and no need to spend time getting your devices to talk to each other. Convenience is one of the biggest barriers to security. Thefts and disasters happen far more frequently because we forget to implement a security measure, often because it is inconvenient. 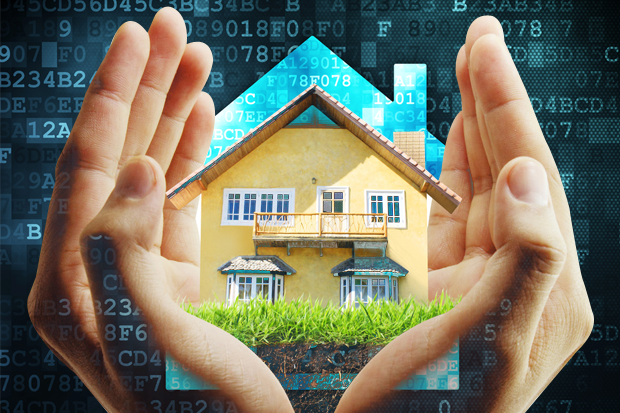 The marriage of security and the smart home is driving the DIY home security market, because the “smarts” in the smart home are bringing a new level of convenience to security.